Down the Byline: Is Bieler Being Bravo'd? 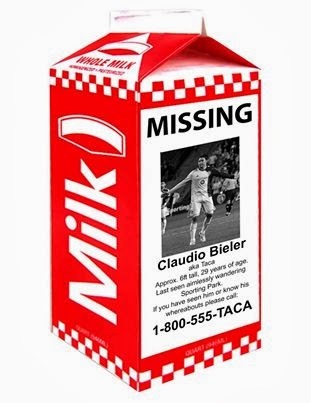 Last night, for the seventh time in the last eight games in all competitions, Claudio Bieler, Sporting KC's designated player did not see the field for KC. In fact for the fourth time in that stretch Bieler wasn't even on the bench. In fact, in the post game interview, Peter Vermes said it was a tactical decision to leave Bieler in KC. Bieler's lack of play down the stretch run for Kansas City has started to draw comparisons to another designated player disappearing act for KC, Omar Bravo. Back in the 2011 season Bravo picked up an injury right before the playoff series against Colorado began. It wasn't bad enough to keep Bravo out of the 18, but he wasn't healthy enough to start. KC walked out of Colorado with a 2-0 win. The team came home and in cold, rainy conditions got the same result. Bravo was on the bench for both games, but didn't play. In the second leg the assumption was because of the weather and keeping him from picking up an injury that could keep him out longer. Then the Conference finals against Houston saw him again on the bench through out the game. With Sporting falling behind in the 53rd minute, it wasn't until the 85th that Bravo entered the game for Seth Sinovic, two minutes before Carlo Costly sealed the game. After the season ended, questions started to swirl about whether Bravo would return to KC next year. Even Bravo himself said that he had a lot to think about regarding the next season. Rumors swirled of loan moves or selling him to a club in Mexico. Then on December 5th came the rumor from ESPN Deportes that Bravo was done in KC due to "problems with the coach." A week later, Bravo was on his way to Cruz Azul. After the fact plenty of rumors came out about Bravo's unhappiness here in KC. Similar rumors about issues with the coach have been swirling for the last few weeks regarding Bieler. None anyone is speaking on, but it's not surprising if they are there based on Bieler's lack of playing time. At some point you have to question whether it's the players or the coach. With Bieler, Vermes said that they'd been scouting the player for a few years, so they should have known the type of player that Bieler was and what would be expected of him when he came to Kansas City. If not, then the blame lies on Vermes and his scouting department for failing to realize the type of player that Bieler is. Questions are being asked of Vermes and his acquisitions, specifically of DPs after Bravo's departure after a year and Bieler's lack of playing time lately. If Bieler isn't even in the 18 come Wednesday I think we can easily assume that Bieler's time in KC will end with just one season, the third DP under Vermes that won't last more than a season for KC. It's sad that people are just asking this question now. I'm wasn't a fan of Bravo, but I kept hearing other people say we didn't play him in his natural position and that we didn't service him properly. The latter part about service seems to apply to Bieler too. If it is form issue, a guy doesn't regain form sitting the bench - or worse - sitting at home. Just think about how much money is being wasted between Benny and Bieler (or Paulo with his injury). Don't worry folks, at least everyone still has faith in Teal's ability to jack one right at the goalie, not jump and battle for the ball (seriously, never fights for headers), and produce very little. Our offense is impotent, pure and simple. Sorry, that's just opinions coming from a frustrated fan (that's probably off the mark about 90% of it). Still, is anybody got a reasonable solution for this year or next? And I just realized I said, "I'm wasn't a fan ..."
I don't think people are just now asking the question. It'd been running through my mind for the last few weeks, but there'd been talk of Bieler having a minor injury. Weibe's tweet I used frustrated me enough to finally just put my thoughts down. PV needs to get beyond his seemingly petty responses to players. Nail down what they need to do, train them to do, and let them play -- especially in the playoffs. Because again, this team will be sitting at home watching the MLS Cup. You can count on it. PV doesn't know how to coach in the playoffs. It's not just another game. Each game is THE game. And yet he messes with his own players' heads so much the team can't play. What a shame. Obviously I am very frustrated. I will be out of town and unable to watch the second leg against the Revs. And I'm glad I can't. Now, as a fan, that is very sad. The way he deals with his "Big time" players is one problem, but let's not forget he hasn't gotten a good SKC team past the conference finals. I think Vermes' position should be reconsidered based on both parts. And if it was me, I'd probably bring in someone new. If SKC can't get into the MLS Cup Final, I think he has had long enough as coach of SKC. Yes, one cup, but MLS Cup is the big prize. Its either complete reset button or continue banging your head on the wall. Our system/press works very well defensively, but there isn't a player that can affectively play that CF roll in it that will be playing in MLS anytime soon, let alone the 4th to 7th choice down the pole in terms of places for stars to go when coming into the league. I fully believe we have hit the Vermes ceiling. I am not sold that we can hope for that much better, however, given our situation in the above mentioned pole, regional location, and willingness to miss on big money players on the chance we hit on a Cahill, etc..
Vermes has a 3 part coaching routine: physical fitness, hustle, then WTF do I do now??? ?